Most community legal centres in NSW provide legal support to families engaged with the child protection system in NSW. This includes early intervention advice and casework to help families understand the roles and responsibilities of the Department of Family and Community Services (FACS), Risk of Significant Harm reports, guardianship orders, alternative dispute resolution, case planning processes, Family Group Conferencing, parent responsibility contracts, parent capacity orders, kinship care and contact orders and disputes. Community legal centres play a fundamental role in child protection issues and engage in legal and non-legal, trauma-informed, culturally competent casework that is flexible, client-centred, responsive and holistic. Currently, only 12 community legal centres in NSW are funded by FACS as ‘Care Partners’ to deliver these services. This is simply insufficient to meet the growing demand and expanding scope for child protection services and legal needs. Further, the uncertainty of ongoing funding after June 2019 create additional concerns. Thus, funding is needed to realise the reform goal of reorienting the system towards early support, prevention and preservation. Increases in investments across all human services is crucial to ensuring families are able to access services when and where they need them. A summary of the recommendations appears below. View our full submission to the inquiry here. FACS’ Aboriginal Case Management Policy. Guaranteed access to justice through timely, affordable and independent legal advice for families engaged with the child protection system, regardless of which stage they are at, is critical and should be a guiding principle for reform. Families need support from their first engagement with FACS to increase understanding of the legal processes and systems involved to avoid the consequences of disengagement. Every family engaged with the NSW child protection system should have the right to free, independent legal advice from first contact with FACS. The principle of self-determination for Aboriginal and Torres Strait Islander people must be reflected in the guiding principles for the Access System Redesign project. It is important to recognise the principle of Aboriginal self-determination for the care, safety and wellbeing of their children in practice. The government must acknowledge and address the systemic drivers of the over-representation of some groups within the child protection system, including Aboriginal and Torres Strait Islander people, people with intellectual disability, people with a history of involvement with the child protection system and people experiencing systematic discrimination and entrenched, intergenerational trauma, disadvantage and financial hardship. The government must acknowledge and address structural barriers to early support for children and families engaged with the child protection system, including through a significant investment of funding to address the chronic shortage of available and accessible services across the human services spectrum, particularly in regional, rural and remote areas. Access to services must not be limited by funding, referral from FACS or lack thereof. The government should invest $10.4 million to establish full- and part-time specialist child protection teams in legal assistance services across the state to deliver early legal advice and support, specialist non-legal casework and advocacy, and community education and outreach (including to FACS and NGOs) about the benefits of early legal advice for families engaged with the child protection system and to establish strong referral pathways and networks. FACS, family support NGOs and other first-responder organisations should establish clear and consistent referral policies, which prioritise referrals for legal advice and support for families at the point of first contact with the child protection system, and which encourage ‘warm referrals’ to all support services. All organisations, agencies and individuals (including families themselves) must be able to refer children and families into key early intervention and support services. Access to services must not be limited to referral from FACS. Current funding is focussed on reactive interventions, which means that significant amounts of children and families may not have access to early support services. 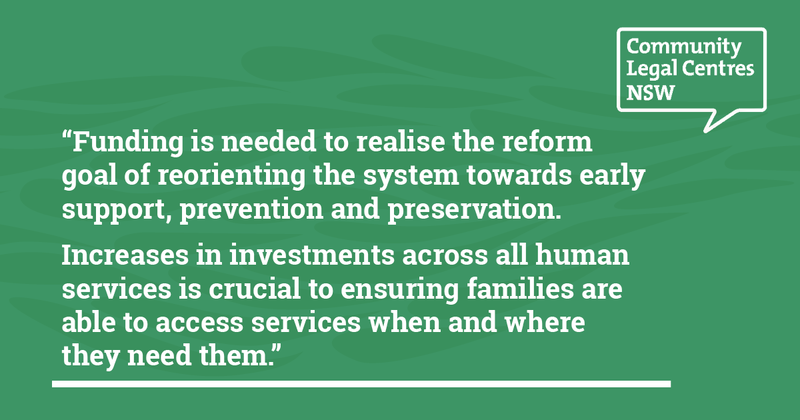 Thus, the government should shift the balance of government funding for child protection from statutory intervention to early support, including directing all new funding for the child protection system to early support, prevention and preservation. This funding needs to be certain, consistent and focussed on preventative measures. The government should invest in successful existing justice reinvestment projects (such as the Maranguka Justice Reinvestment Project), expand the model across the state, and support communities to develop justice reinvestment approaches to supporting the safety and wellbeing of children and families engaged with the child protection system in NSW. The government should amend the Children and Young Person’s (Care and Protection) Act 1998 (NSW) to introduce a requirement that all families engaged with the child protection system in NSW have access to affordable, independent legal advice and support throughout their engagement with the child protection system, from point of first contact to final orders. The government should amend the Children and Young Person’s (Care and Protection) Act to require FACS to make ‘active efforts’ to provide support services to children and families engaged with the child protection system. This would result in accountability for FACS to work with families prior to taking court actions and would ensure that vulnerable parents, such as women in prison and parents with intellectual disabilities, cannot be excluded from restoration with their children. FACS should undertake audits of all Community Service Centres across all locations to support appropriate policy, practice and reform implementation and provide improved training for staff, including ongoing cultural competence and cultural safety programs. Quality of service delivery should be consistent and non-discriminatory, despite geographic location or allocations of caseworkers.